We offer a fast, easy way for you or your group to train and receive CPR certification for teachers. As a teacher, you’re responsible for guiding and instructing the youth of today in important subjects that they will carry with them for the rest of their lives. Additionally, you have the added responsibility to keep your students safe during the school day and during extra-curricular activities including sports, theatrical productions and field trips. Unfortunately, emergency situations can occur during the most unexpected and inconvenient times. CPR certification for teachers is a way to be prepared and confident to offer assistance during an emergency. Sudden Cardiac Arrest or SCA is responsible for the death of over 350,000 people annually, many of them school age students participating in sports or physical education classes. Young male athletes are the most prevalent group to experience SCA, with an average age of 17.5 years at the time of the incident. Complete preparedness for emergency situations that may occur during school or during an extracurricular activity includes CPR certification for teachers. Most people will have heard of Cardiopulmonary Resuscitation or CPR, but other than seeing someone on television perform it, how many of us have the knowledge and skills to confidently use these techniques ourselves? 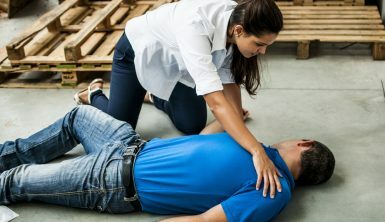 CPR includes chest compressions and, in some cases, rescue breathing operation in order to perform the functions of a victim’s heart and lungs until their own body takes over. We’ve developed an easy, efficient training class that breaks down each technique and how to perform them perfectly on adults, children and infants so that you can be confident when an emergency arises. The goal of performing CPR on a victim who has experienced sudden cardiac arrest is to restore the pulse and breathing by acting as the heart and lungs for as long as it takes for their own body to take over. By keeping the blood pumping to vital organs of the body such as the brain, performing CPR not only saves lives but can also prevent further damage from occurring to the victim. CPR certification for teachers not only covers these life-saving techniques, it explains the requirements for different age groups and covers the use of automated external defibrillator devices and how this technology can be used to save lives. As a first-responder in an emergency situation, you have rights and legal safeguards that clear you to be free to offer help and assistance should the need arise. Not only does the National CPR Foundation offer you the techniques to use to save a life, we also give you knowledge and confidence that you should use your training should the need arise. Does my state require CPR certification for teachers? Keep in mind that, even if your state isn’t on this list, your school or your local government may have a requirement for CPR certification for teachers over and above the other certifications they require of you. Not to mention, more and more legislation is being passed that requires graduating students to be certified in CPR as well, which would make CPR instruction part of your curriculum. 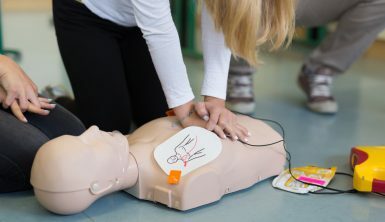 Moreover, there are many nuances to these laws and requirements, some also mandating certification in how to use AED devices, certification in first aid and other training and techniques. CPR certification for teachers is valuable knowledge that can come into play in many situations, not just those that are school related. With the knowledge that CPR certification provides to you during your certification process, you will be able to fall back on the skills you’ve acquired for emergencies in your own home or daily life, should they occur. You’ll be surprised how empowered you feel after becoming CPR certified if you’re ever in an emergency situation. Busy teachers often struggle to fit additional education into their daily lives; fortunately the National CPR Foundation’s online course is easy to fit in to any spare moment of the day. The course is completed quickly, with the virtual lessons constructed in a user-friendly way that takes under one hour from start to finish. Offering the maximum in convenience, you can then order your certification at the same time, with delivery completed in less than two weeks. Additionally, the only thing you pay for is your certification; the instruction is absolutely free, taken at your own pace and conveniently located online. Additional discounts are offered to groups of five or more teachers and school personnel, which make the National CPR Foundation course offering even more attractive over other programs. Plus your certification is valid for two whole years before you must refresh your information and recertification. How can I get CPR certification for teachers? We offer free, comprehensive training on CPR, First-Aid, BBP, and BLS certification that will help you save a life both in and out of the classroom. You pay only for your certification, when complete, which is valid for two years. Discounted rates are offered to groups, so why not gather as many fellow teachers and administrators or even student body leaders to become certified along with you? Our state-of-the-art user interface is easy to understand, completely user friendly and will have you on your way to CPR certification quickly and easily. Thousands of teachers have become CPR certified through National CPR Foundation over the years using their PC, mobile devices or tablets. After completing your certification training, you will be thoroughly tested after a comprehensive course review. In just a few minutes, you’ll be able to demonstrate that you’re ready to act during an emergency situation by giving life-saving CPR. What does the National CPR Foundation certification course cover? CPR certification for teachers doesn’t just include knowledge of performing CPR itself, though that is the heart of the program. We begin by giving an understanding of the legal ramifications of performing CPR as a good samaritan so that you know your rights when offering assistance during an emergency. We include detailed instruction on giving CPR to adults, as this age group is in the majority among those who suffer from sudden cardiac arrest. From this knowledge foundation, we then instruct on how to administer CPR to children and students, who have a different set of requirements. Finally, we then inform you of the unique requirements that infants having during emergency situations so that you can offer life-saving assistance with the special care they need. This isn’t the end of our instruction; we then delve deep into the device that is being installed all over the country in schools and other public places, the automated external defibrillator or AED. Your instruction on the use of AED devices will compliment your CPR certification training by giving you knowledge on how this device should be used safely and effectively after CPR efforts have failed. This technology, when available, can be invaluable to rescue efforts if a person like you is around who knows how to use it. After you have been thoroughly instructed, a brief review period will be allowed prior to the final step in your journey, which is certification. You will be given an online test consisting of ten questions that must be answered correctly, and you can re-take this test as many times as necessary to prove to yourself that you know the information backwards and forwards. 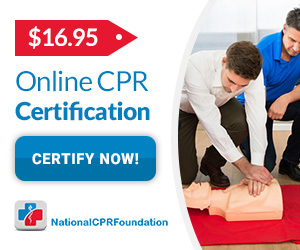 After you’ve passed the test, you can purchase your certification, which is the only thing we charge for at the National CPR Foundation. How long is CPR certification for teachers good for? Your certification will be valid for a two year time period, during which we hope you aren’t required to use your newly acquired information. Over that amount of time, there are liable to be changes to the way lives are saved using CPR. National CPR Foundation will be continuously updating our information and teaching methods so that, when you return to re-certify yourself, you will be given the most up-to-date information possible. Those who return for recertification are allowed to skip the course modules and immediately take the certification test and order your new certificate. We offer email support for any and all questions and our certification is valid worldwide because National CPR Foundation follows not only American Heart Association guidelines but also ECC and ILCOR requirements as well. Though other online programs exist, none are as widely accepted, easy or free as National CPR Foundation’s class in CPR. Easy, convenient and free except for the certification itself, CPR certification for teachers through National CPR Foundation is available for groups and individuals to begin immediately. We offer complete access to all the information at any time of day as well as free, 24/7 email assistance, should you require it. When you’re confident that you know the information, you can take the test as many times as required to confirm your expert knowledge. Then and only then do you have to pay for the certificate itself, which we dispatch within two weeks and is valid for two years. Sudden cardiac arrest can happen at any age, in any setting at any time. Being prepared to respond and save a life is as easy as clicking Begin Course on our web site. Gather your fellow teachers, school administrators or even students to join you in gaining this valuable knowledge and skill set today. You or someone close to you may save a life one day.